Women in the United States are waiting longer to have children than in the past, but they are still starting their families sooner – and ultimately having more children – than women in many other developed nations, according to a new Pew Research Center analysis. 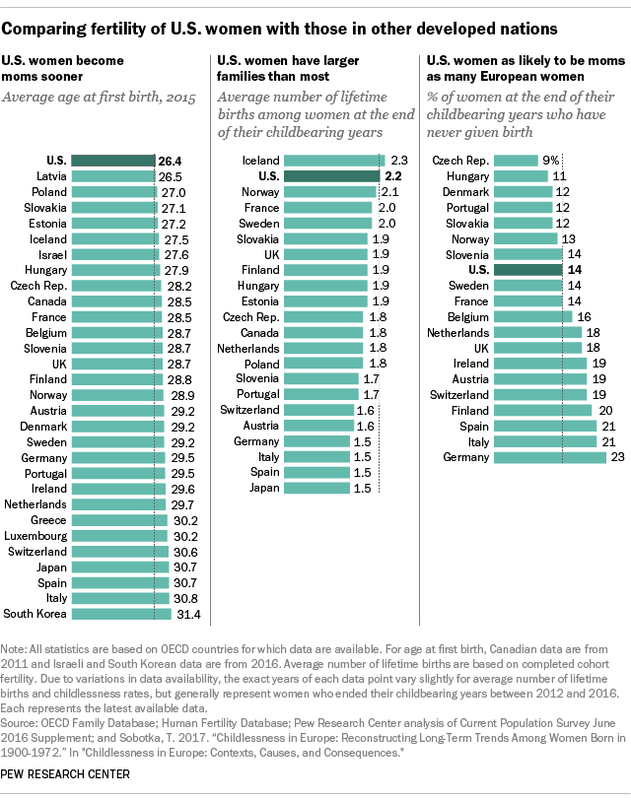 The average age at which U.S. women first become mothers is 26.4 – comparable to the age at first birth among Latvian women but lower than in the 28 other nations in the Organization for Economic Cooperation and Development (OECD) for which data were available. At the other end of the spectrum, South Korean women are the oldest when they first give birth (31.4 years, on average). On average, women in Greece, Luxembourg, Switzerland, Japan, Spain and Italy are also in their 30s when they become mothers. Not only are U.S. women becoming moms sooner than many of their OECD counterparts, they are also ending their childbearing years with larger families – 2.2 children, on average. Of the 21 other OECD nations with available data, 20 have lower lifetime fertility, the only exception being Iceland. There, women at the end of their childbearing years have had 2.3 children, on average. In contrast, lifetime fertility dips below 2.0 in 17 other nations, going as low as 1.5 in Germany, Italy, Spain and Japan. All told, the share of U.S. women at the end of their childbearing years who ever had a baby now stands at 86%, while 14% are childless. This is about the same as rates of childlessness among women in Norway, Slovenia, Sweden and France. In contrast, almost one-in-four German women (23%) end their childbearing years having never had a baby. Rates of childlessness reach 20% or more in Finland, Spain and Italy, as well. At the other end of the spectrum, only 9% of women at the end of their childbearing years in the Czech Republic have never given birth.